Low grade chondrosarcoma: is long-term follow-up necessary? INTRODUCTION: Currently, the follow-up regimen for patients treated for low-grade chondrosarcoma is similar to that of all chondrosarcomas. It is possible that low-grade chondrosarcoma may have a far more benign course than other chondrosarcomas and, if treated adequately, may require a far less vigorous follow-up regimen. PATIENTS AND METHODS: A retrospective study was performed on all patients treated for chondrosarcoma at the Pretoria Musculoskeletal Tumour Unit,, University of Pretoria, over a 22-year period, between 1987 and 2009. In total 56 patients were treated for chondrosarcoma over this period, but two patients were lost to follow-up. The study totalled 54 patients. The grade of chondrosarcoma, outcome and tumour recurrence was evaluated in these patients. The lesions were divided into four histological grades: atypical enchondroma (grade 0), low-grade chondrosarcoma (grade I), intermediate grade chondrosarcoma (grade II), and high-grade chondrosarcoma (grade III). RESULTS: Histologically 46 tumours were low-grade (grade 0 or I) chondrosarcoma (82%), there were nine cases of intermediate (grade II) chondrosarcoma (16%), and one patient had a metastatic mesenchymal chondrosarcoma. The femur and humerus were the commonest sites involved. The axial skeleton was affected in only three cases, all of which had more aggressive lesions. Two patients died, one with metastatic mesenchymal chondrosarcoma involving the scapula, and the other with an intermediate (grade 2) lesion of the pelvis. There was no tumour recurrence in 49 patients after a mean period of 57.5 months, of which 42 patients had low-grade (grade 1) lesions, and seven patients had intermediate (grade 2) lesions. Two patients with low-grade lesions were lost to follow-up. Three patients presented with recurrence, all of which had a local recurrence. No metastatic disease was detected radiographically. Of these three patients one had a grade 2 lesion, and the other two patients were initially not treated with surgical adjuvant therapy. Not one patient with low-grade chondrosarcoma treated adequately with local curettage and surgical adjuvant therapy presented with local recurrence or distal metastasis. CONCLUSION: We believe that adequately treated low-grade chondrosarcomas have a very low local recurrence rate. Treatment consists of local curettage with surgical adjuvant therapy. When faced with recurrence, it rarely presents with distant metastases. A revised follow-up schedule is advised consisting of visits at 3 and 6 months and followed by yearly visits for 5 years. This appears to be adequate for timely detection and treatment of any local recurrence of low-grade chondrosarcoma. Currently, the follow-up regimen for patients treated for low-grade chondrosarcoma is similar to that of all chondrosarcomas. It is possible that low-grade chondrosarcoma may have a far more benign course than other chondrosarcomas and, if treated adequately, may require a far less vigorous follow-up regimen. Chondrosarcoma is defined as a malignant tumour characterised by the formation of cartilage by the tumour cells. Chondrosarcoma is the third most common primary malignancy of bone after myeloma and osteosarcoma,1 and has a slight male predominance. Cartilage tumours of bone exhibit a wide clinical, radiographic and histologic variability. Although differentiation between highand low-grade cartilage tumours can easily be made on the basis of histological and radiographic findings, the distinction between low-grade chondrosarcoma and enchondroma can be less clear. The behaviour of chondrosarcoma varies from slow-growing, nonmetastasising tumours to highly aggressive metastasising sarcomas. The prognostic factors that determine the outcome are related to the histologic grade, anatomic site, tumour size, and the adequacy of treatment. Contrary to high-grade chondrosarcoma, low-grade chondrosarcoma has a very low local recurrence and metastatic rate.2 It is therefore possible that a revised follow-up regimen could be employed in these low-grade tumours. A retrospective study was performed on all patients treated for chondrosarcoma at the Pretoria Musculoskeletal Tumour Unit, University of Pretoria, over a 22-year period, between 1987 and 2009. In total 56 patients were treated for chondrosarcoma over this period. Followup data was available on 54 patients with chondrosarcoma, involving the axial and appendicular skeleton. There were 36 females and 20 male patients, with a mean age of 46 years that ranged from 13 to 74 years. The follow-up period ranged from 7 months to 123 months with a median period of 56.8 months. The clinical, radiological and histology records were scrutinised, with attention directed at the presenting symptoms, treatment methods, radiologic appearance and histologic grade. The histological grading system used was based on that described by Rosenthal.5 Conventional chondrosarcoma is divided into four histological grades comprising atypical enchondroma (grade 0), low-grade chondrosarcoma (grade 1), intermediate grade chondrosarcoma (grade 2), and high-grade chondrosarcoma (grade 3). The atypical enchondromas were difficult to distinguish from low-grade chondrosarcoma, but were distinguished from benign enchondroma on the basis of an increased cellularity, more aggressive local invasion on radiography, and unusual pain. 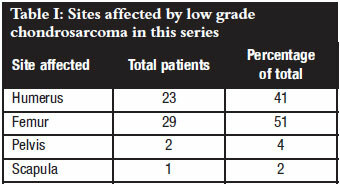 Histologically 46 tumours were low-grade lesions. The low-grade group included grade 0 and 1, as it is sometimes very difficult to make a direct distinction between the two groups. Nine patients were classified as intermediate (grade 2) lesions, and one had metastatic mesenchymal chondrosarcoma. The different sites affected are summarised in Table I. Following biopsy, 46 patients were treated with intralesional excision with curettage and adjuvant cryotherapy. Intraosseous defects were reconstructed in 38 patients using allograft only, and eight patients needed internal fixation. Eight patients were treated with resection of the tumour and allograft reconstruction, one patient underwent an amputation, and in one patient a scapulectomy was performed. In the study group of 56 patients, incidental diagnosis was made in 20 patients (Figure 1). These patients presented with other medical conditions, and incidental radiographs revealed a tumour. Twenty-eight patients complained of pain in the area of the affected site (Figure 2), and pathologic fractures were encountered in three patients. Biopsy revealed 46 with low-grade chondrosarcoma (82%), and nine cases of grade 2 chondrosarcoma (16%). The femur and humerus were the most predominant sites involved, and the axial skeleton was only affected in three cases. All the tumours involving the pelvis were grade 2 chondrosarcomas. One patient presented with a pelvic mass and intra-abdominal metastases. Laparotomy revealed an inoperable lesion. The patient with a mass in his scapula was diagnosed with a mesenchymal chondrosarcoma and passed away within 8 months after diagnosis due to metastases in the lungs. The majority of appendicular skeleton lesions were low grade. They were surgically managed by curettage, adjuvant cryotherapy, bone graft and internal fixation when needed. Patients were followed up for a mean duration of 56.8 months. Two patients were lost to follow-up. Two patients died during the study period, both of whom had aggressive lesions involving the axial skeleton. There was no recurrence noted in 49 patients after a mean period of 57.5 months' follow-up. Of these patients, 42 had low-grade lesions, and seven patients had grade 2 lesions. Only three patients involved in the study presented with local recurrence, but no metastases were detected radiographically. The first patient was a young female who was originally diagnosed with a grade 2 lesion. This lesion was curettaged, and given adjuvant cryotherapy. The resulting defect was filled with allograft. The local recurrence occurred two years later and was found to be of low grade. The recurrence was excised and no further recurrence was detected for a 5-year follow-up period. The other two patients presenting with a local recurrence were initially treated at a peripheral institution for their primary tumours, and referred to us when the recurrence occurred. No evidence of adjuvant surgical therapy could be confirmed in their history. They were both treated using the surgical regimen described above, with no subsequent recurrence for a 5-year follow-up period. The aim of the study was to establish an adequate follow-up schedule for treated low-grade chondrosarcoma. The rate of local recurrence and metastases was evaluated in our unit for patients treated over a 22-year period. One of the biggest challenges in orthopaedic oncology is to distinguish an enchondroma from a low-grade chondrosarcoma. 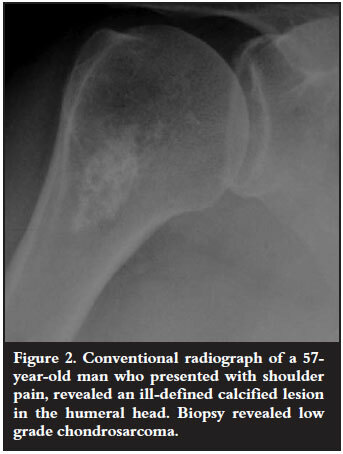 In a high-grade chondrosarcoma, all the clinical, radiographic and pathologic findings are generally apparent. When dealing with low-grade malignant cartilaginous lesions, obtaining a precise diagnosis and planning a definitive treatment plan is much more challenging.8 The importance of a multi-disciplinary approach between an orthopaedic oncologist, radiologist and pathologist contributing to the precise diagnosis of these tumours cannot be overemphasised.8 The clinical picture, radiographic characteristics and histological findings are combined following biopsy and only then can a diagnosis be made accurately. Radiographically low-grade intramedullary chondrosarcomas are usually centrally located within the metaphysis or diaphysis of the proximal humerus, the femur and proximal tibia, and less frequently affects the axial skeleton.2 These tumours are usually geographically well defined, and characterised by a calcified matrix, commonly described as punctuate, stippled or popcorntype in distribution9 (Figure 3). Endosteal scalloping, which is the lesion's attempt to extend into a second compartment, is found because the lesion is not aggressive enough to break through the cortex. The cortex then maintains the lesion within the medulla. Murphy reported scalloping of greater than two-thirds10 occuring in 75% of chondrosarcomas and 10% of enchondromas. Cortical destruction is a reliable finding suggestive of a high-grade lesion. Frank bone destruction, cortical thickening and soft tissue extension are usually radiographic hallmarks of a more aggressive cartilaginous tumour. To obtain a true representative biopsy of a cartilage tumour is often challenging due to the heterogeneity found in the lesion.6 Careful preoperative radiographic evaluation by the treating surgeon is essential in determining the correct biopsy site. The biopsy should be taken from the more aggressive areas of scalloping, a soft tissue component, or regions of the tumour with minimal matrix mineralisation.11 When interpreting the results, it is important for the pathologists to review the radiographs and consult with a musculoskeletal oncologist. This collaboration serves to improve the accuracy of the diagnosis. It is therefore preferable for the patient with a low-grade chondrosarcoma to be referred to a musculoskeletal tumour unit before any surgery (including biopsy) is performed.12 This is clearly illustrated by the current study in which two of the three patients who presented with recurrence were initially not treated in a specialised unit. Specialised tumour units follow the above-mentioned protocol and have a lot of experience with the treatment of these tumours. 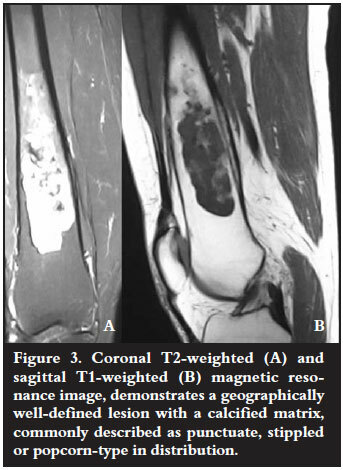 With appropriate selection, it appears that radiographically less aggressive (grade 1) chondrosarcoma of the long bones can be treated effectively with intralesional curettage and adjuvant treatment such as cryotherapy.4,11 Adjuvant treatment of the cavity kills residual microscopic foci of tumour, and extends the oncologic margins of treatment.4 Following intralesional excision of the tumour, reconstruction of the cavity using allograft bone or bone cement is usually necessary to restore the mechanical integrity of the affected bone14 (Figure 4). In patients with a more aggressive component, or lesions affecting the pelvis or scapula,3 wide resection is mandatory, with reconstruction of the segmental long bone defect. The vast majority of cases seen in this study were low-grade lesions. These lesions were surgically treated according to current international protocol.4 In the 56 patients reviewed a very low local recurrence rate was found. Only three of the 56 patients developed local recurrence, with no distant metastases noted. Of those three, two patients were not initially treated in our unit and it is unclear whether adjuvant therapy was given. The patients were followed up according to the protocol stated in the introduction. With appropriate selection, adequate multi-disciplinary work-up, and effective surgical treatment within a specialised musculoskeletal tumour unit,11 treated low-grade chondrosarcomas have an excellent prognosis. When confronted with an accurately diagnosed low-grade chondrosarcoma the clinical, radiographic and histopathological data must be carefully assessed and analysed. This is done in order to determine the appropriate surgical plan, which will match the aggressiveness of the lesion. Chondrosarcomas involving the flat bones should be regarded as being biologically more aggressive. They should be approached differently from lesions involving the appendicular skeleton. It has been demonstrated that adequately treated low-grade chondrosarcomas have a very low local recurrence rate.16 Any recurrence usually occurs with in the first five years,16 in and around the original tumour site, and rarely presents with distant metastases. This leads to a proposed revision of currently used follow-up regimens for low-grade chondrosarcoma. It would seem to be adequate that the patient is followed up at 3 and 6 months, followed by yearly visits for 5 years. At these visits, both clinical and radiological examinations are meticulously performed. This revised schedule of visits appears to be adequate for timely detection and treatment of local recurrence in patients treated correctly with low-grade chondrosarcoma. In the light of these findings, fewer follow-up visits and radiologic exposure of the patients will therefore be needed. This will also lead to a reduced financial burden on the healthcare system. No benefits were or will be received relating to the content of this article.